"The industry leading IOmark results achieved by the IBM V9000 are significant, setting new performance levels both for the number of VM's and the number of VDI instances, combined with the proven enterprise features of the V9000." 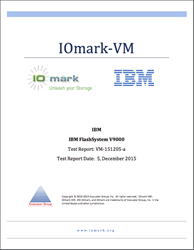 IOmark and Evaluator Group announce new benchmark results for IBM FlashSystem V9000 for both IOmark-VM and IOmark-VDI, achieving 1,600 IOmark-VM's and 4,096 IOmark-VDI instances. "As companies look to move enterprise workloads to all Flash storage systems, they need high performance and enterprise class data protection features," said Russ Fellows, Senior Partner of Evaluator Group. "The industry leading IOmark results achieved by the IBM V9000 are significant, setting new performance levels both for the number of VM's and the number of VDI instances, combined with the proven enterprise features of the V9000." "This demonstrates IBM's investment to be the leader in this area," said Eric Herzog, Vice President, Product Marketing and Management, IBM Storage Systems and Software Defined Infrastructure. "It is our commitment to enable our clients to expand into new applications with a system that is a proven enterprise player." The IOmark benchmark results are audited to ensure uniform testing and reporting of results, enabling IT users the ability to compare products using metrics that matter: price, capacity and application performance. IOmark is dedicated to helping IT professionals and Vendors effectively measure and compare storage system performance while running real application workloads. IOmark-VM was released in 2013, after the 2011 release of IOmark-VDI. More information is available at http://www.iomark.org. For more information about Evaluator Group, Contact Nick Waterhouse at 303.221.7867 x1008 or nick(at)evaluatorgroup(dot)com.